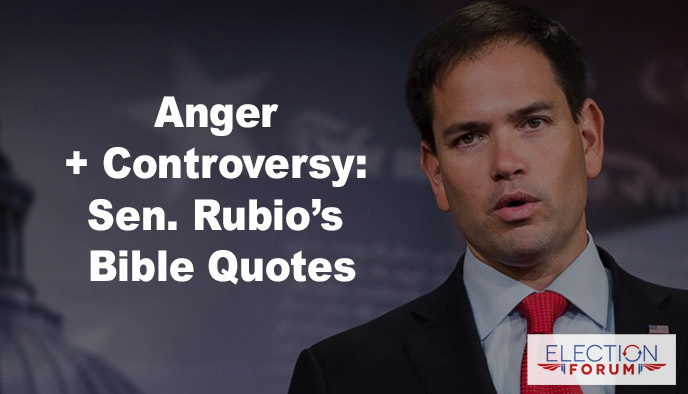 The reaction against Senator Marco Rubio was huge…just for tweeting two Bible verses. Do you think they are controversial? One user was so concerned that they called for a welfare check on Senator Rubio. The day Rubio posted these verses, the Catholic Church daily readings happened to include those verses. Beautiful Scriptures that are not offensive in the least. It’s called CONVICTION! If it was from his heart that he wrote these verses, then there is no controversy. However, if he is using scripture to get on the Christian band wagon, well then Mr. Rubio will answer to God for that. We are not to judge him. The scriptures he used were spot on though. They are not only NOT offensive, they are necessary today, perhaps more than in the last 70 years. We need more of this from our elected representatives. It reflects the values and thinking of our founders, who could object to that? I believe the recoil of fear and loathing is simply from those who are opposed to the light of truth and like a vampire curse the sun. He’ s free to write anything on his tweets. Is he not? He’s a Christian and he’s praising God! He’s honest and open about his faith! I see no problem with these scriptures being used by Rubio. Good for him. Need more Senators to do the same. what happened to freedom of speech? Is that only when you aren’t an elected official? Nope. I think this just shows how strong and aggressive the anti-christian groups have gotten. But Jesus told us not to be ashamed of Him and the first commandment is to love the Lord our God with all our heart, soul and mind…this is putting Him first where He belongs. We need to stand up for our values and be ready to share the good news both in and out of season. This is sharing of Scripture without personal comments…way to go Marco. Scripture should be a welcome sight. Thank you for speaking the TRUTH. God bless America! Praise God someone is quoting scripture, our country was founded on the Word, whether anyone likes it or not and the more we stray away from that the more we lose our nation…God’s wisdom is above ALL else! God’s word gives light. Darkness hates light because light dispells darkness.